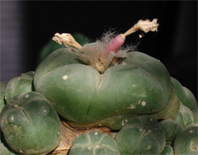 Aphids are typically not a problem when growing cacti as they seem to prefer more tender plants, like the growing tips and undersides of e.g. Capsicum plants (a.k.a. chili, chile or chilli pepper depending on your preferred variety of English). Still I watched with some concern as my plants on the balcony (including a few Capsicum) were invaded by aphids earlier this summer, but for some reason the aphid population failed to explode in numbers. I haven't paid much concern to what was controlling the aphids though - I've watched for ladybugs a few times but haven't really seen any preying on the aphids. 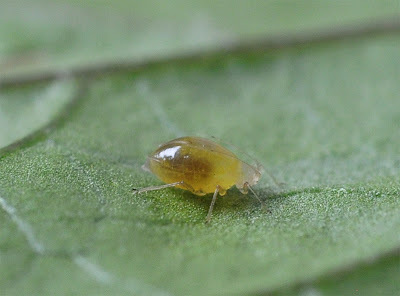 Then a few days ago I noticed some brownish grey spots on the leaves, thinking at first it was some new kind of pest munching away on my plants. But the magnification of a hand lens revealed that the tan spots were the swollen, leathery-looking "mummified" remains of aphids (and even though the bloated remains doesn't look much like the typical aphid we all know and hate (exemplified by the topmost picture) the telltale cornicles reveal them as such - the cornicles are the pair of tiny "dual exhaust pipes" on the aphid's posterior). 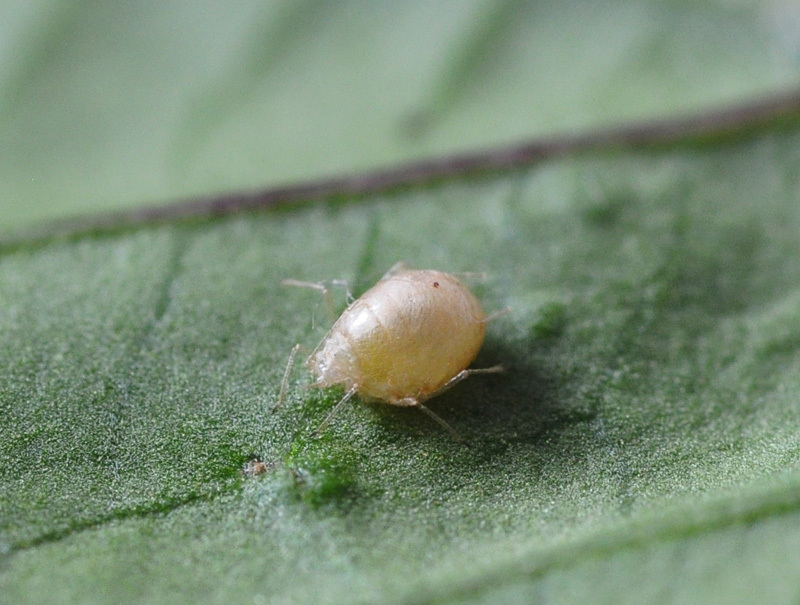 Evidently an aphid parasitoid is at play, laying its eggs inside living aphids that act as lunch boxes for the growing larvae. Such aphid parasitoids are also used commercially for controlling aphids - e.g. Aphidius matricariae are released in many greenhouses. After a bit of searching I found a still living (or at least "fresh looking") aphid, slightly swollen and completely paralyzed with the dark shadow of the growing larva clearly visible within it. 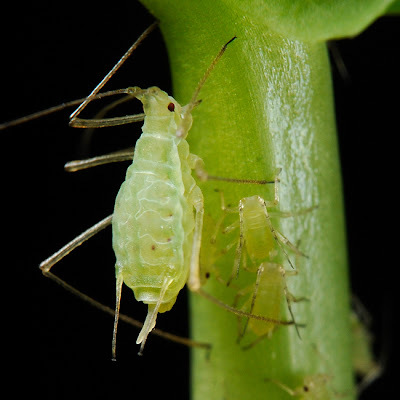 Eventually all that will be left of the aphid host is the leathery-looking "mummy" and the larva developing within will emerge shortly as an adult to sting more aphids.